Carries extra error information in replacement-related llvm::Error, e.g. fail applying replacements and replacements conflict. Definition at line 154 of file Replacement.h. Definition at line 156 of file Replacement.h. 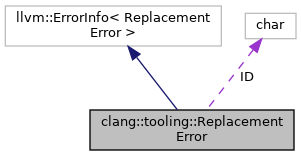 Constructs an error related to an existing replacement. Definition at line 159 of file Replacement.h. Constructs an error related to a new replacement and an existing replacement in a set of replacements. Definition at line 164 of file Replacement.h. Definition at line 172 of file Replacement.h. Definition at line 180 of file Replacement.h. Definition at line 176 of file Replacement.h. Definition at line 170 of file Replacement.h. Definition at line 180 of file Replacement.cpp. References clang::tooling::Replacement::getFilePath(), clang::tooling::Replacement::getLength(), clang::tooling::Replacement::getOffset(), getReplacementErrString(), clang::tooling::Replacement::getReplacementText(), ID, clang::tooling::Replacements::merge(), clang::tooling::overlap_conflict, and llvm::str(). Definition at line 174 of file Replacement.h.